Erik M. Herzfeld is an Advisor to SIP. 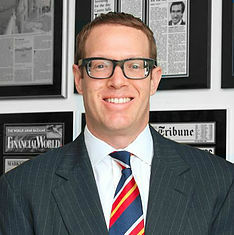 Erik is President of Thomas J Herzfeld Advisors, Inc., Co-Portfolio Manager of The Virtus Herzfeld Fund, and President & CEO of The Herzfeld Caribbean Basin Fund, Inc.
Before starting his own businesses, Erik spent a decade on Wall Street in the equity and foreign exchange/currency derivatives markets. Erik served in quantitative research, trading and management roles with both Lehman Brothers and JP Morgan, based in New York and Asia. He headed the Specialized Risk Trading (SRT) group which managed a $200 billion derivatives book for JPM out of Singapore. Erik is the creator of the Bloomberg-JP Morgan Asia Currency Index “ADXY” (FX basket). Erik is fluent in Japanese and holds a FINRA Series 66. Erik has a B.A. in Economics with concentration in Mathematics from Johns Hopkins University and an S.M. in Financial Engineering from the MIT Sloan School of Management.